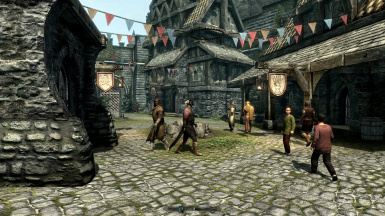 Adds more life to cities by spawning randomized NPCs in towns that will walk about the city, and interact with their surroundings. 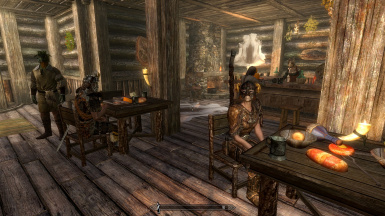 -NPCs no longer hang out at inns all night. They will wait until 12AM the latest. 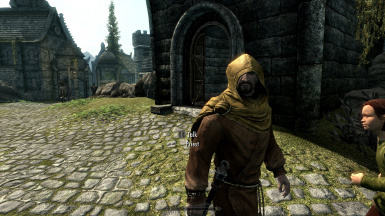 -NPCs have a chance of entering stores and temples. -Travelers may spawn in pairs. -Up to 3 children may spawn in any of the major cities. -A merchant and his gaurd have a chance of spawning in any of the major cities. -Repairmen may have a chance of spawning in any of the major cities. They will hammer certain metal and wooden structures in the city. -Night time NPCs will spawn at 9-10PM. 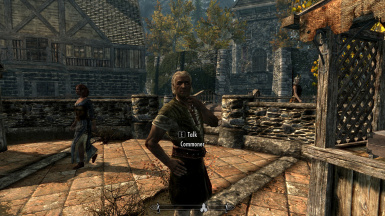 -Riften citizens will avoid the market area during Brynjolf's sales pitch, making it easier to complete the related quest. Fixed a perpetual script error. 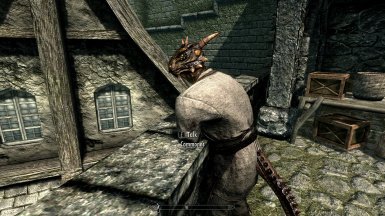 Removed dragon breathing sound effect from a wood elf. Cleaned ESM and ESP of unwanted edits. 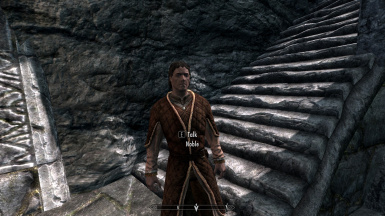 Modified AI packages to point NPCs to persistent references. Info on intermittent updates are at the bottom of the Description page. Fixed an issue where NPCs will stand at their spawn and do nothing for several seconds. that will wander about the area. farmers, mages, and adventurers. More will be added later. 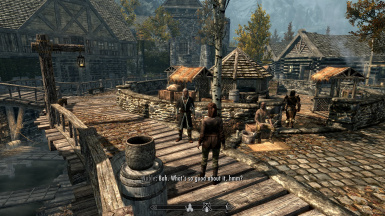 Throughout the day, several NPCs will spawn and walk about the city and interact with their surroundings, and occasionally talk with each other. 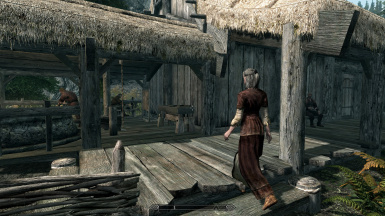 in, daytime NPCs will head to the local inns and wander and interact with the interior, while night time NPCs will spawn and walk the streets. cities, simply adding to the ambience. The same NPCs will persist in the city all day until their "sleep" time, and reset whenever they "wake". city's cells are reset, and that is governed by the game's respawn time. bugs that you encounter, offer suggestions, or any constructive criticism. Thank you, and I hope you enjoy the mod! 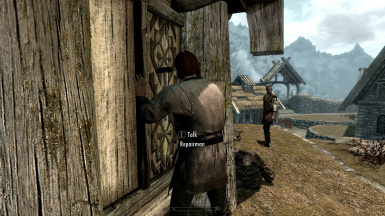 - Extract all the files into the Skyrim main folder. 2) Load the save file. 3) Save as a new file (Never overwrite, just in case you need to roll back). Your save is now clean of old Populated Cities data! - Bug: NPCs may not reset if you wait past their sleep AND wake packages. 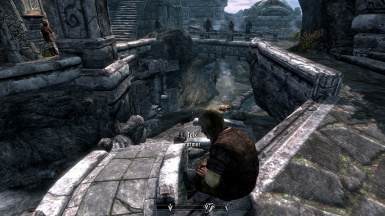 - Bug: Sometimes NPCs in Solitude may fall to their deaths when entering the city. - Bug: Save file does not load! I'm stuck at the loading screen when trying to load from the main menu. 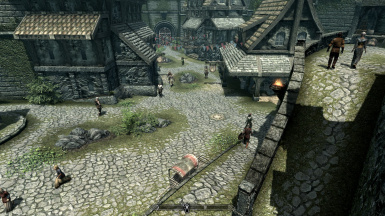 - Bug: NPCs may crowd up at a specific spot when you enter a city for the first time after activating the mod. - Fix: They will disperse after half a minute and won't crowd up again. Q: Is there any performance loss? Q: How did you fix the grey faces? -Crash issues should be resolved now. Empty properties in previous version are now deleted, or point to a placeholder. -Changed disabling and reseting script. 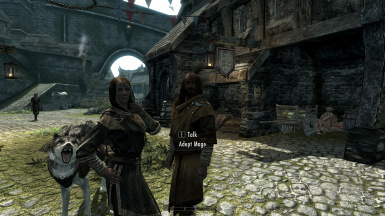 -Fixed Whiterun merchant and merchant guard. 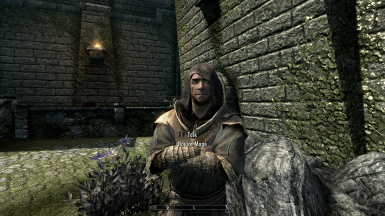 Merchant will now sell, and guard will follow him instead of standing by the gate. -Increased distance a traveler's follower needs to be within before they run. -Changes to general night time AI packages. 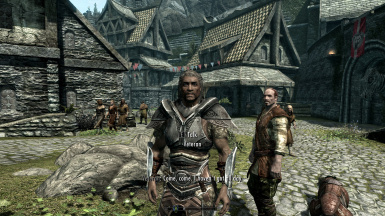 -Orcs now appear in Markarth. -Additional changes to Populated Cities' NPC levelled lists. -Fixed NPC schedules which caused them to exit inns too early. 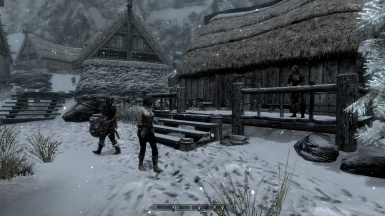 -Fixed Solitude repairmen who were walking to Whiterun. 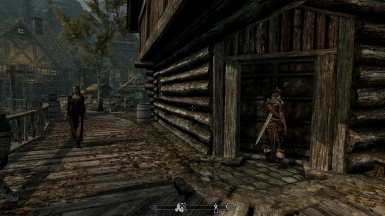 -Fixed mercenary standing in Whiterun all day. -Changed preferred movement speed for following travellers to always walk. -Changed script properties which were giving errors. 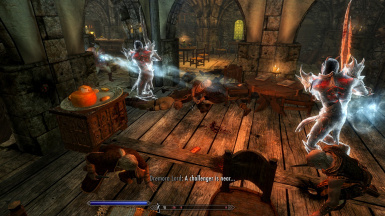 -Added Repairmen to Markarth and Windhelm. 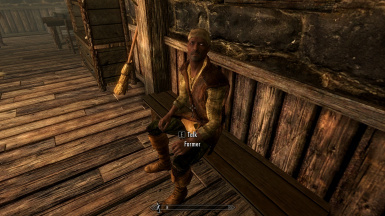 -Added 4 more Redguard nobles. -Fixed a perpetual script error. 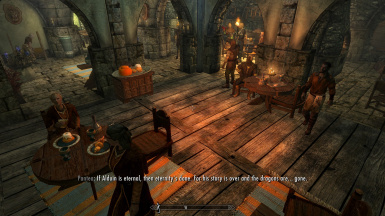 -Removed the dragon breath sound effect from the wood elf. -Cleaned the esp of dirty records. i.e. Accidental changes to stuff in the game that were saved with the esp. -Changed AI Packages so their destinations point to persistent references. -Fixed issue with crime not being reported by the random NPCs. -Included both meshes and textures to fix the grey faces. -Fixed an issue where NPCs may stand around their spawn doing nothing for several seconds.